If one was to look at the blueprints for the Norsecore style, three records come to mind instantly. Marduk’s “Heaven Shall Burn…”, Immortal’s “Battles In the North” and Dark Funeral’s “The Secrets Of the Black Arts”. All three laid down the tropes and conventions and are historically important for this reason. While the Marduk and Dark Funeral albums are largely similar in construction and architecture, the Immortal record deviates from the form in terms of music and lyrical subjects. 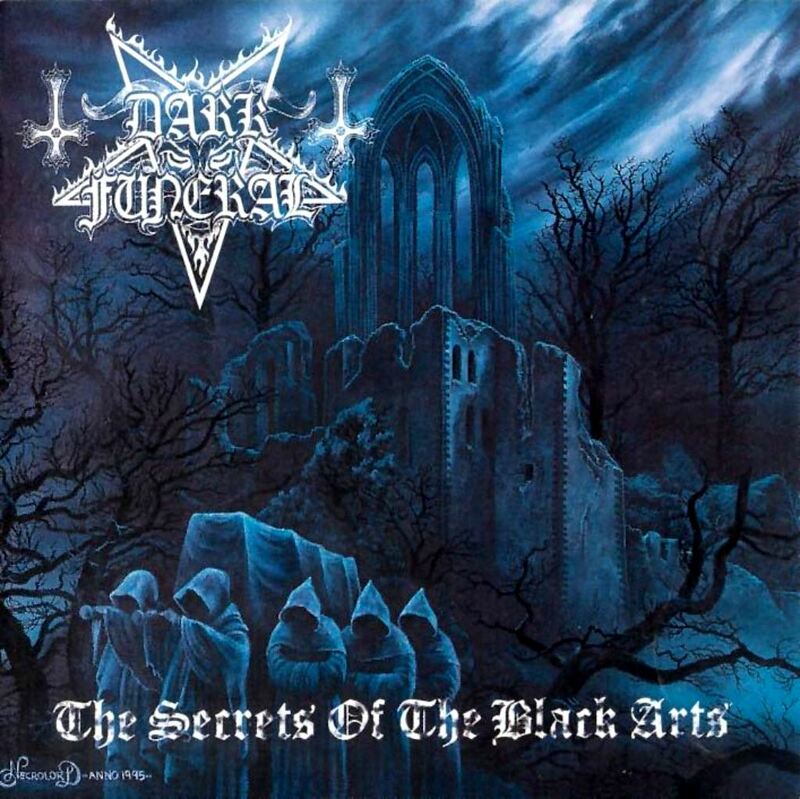 At the same time “The Secrets Of the Black Arts” is interesting because it is the only record of its kind in the now extensive Dark Funeral catalogue. Let’s find out why that is. Written almost entirely by former Necrophobic co-founder/guitarist David Parland, and recorded (after an aborted session at Unisound with Dan Swano) at Abyss Studios by then up-and-coming producer Peter Tägtgren (Hypocrisy), this is at its heart a much faster, leaner and overall meaner Necrophobic record. A record like this readily proves black metal’s lineage to the earlier death metal format. Squint your eyes and tilt your head a bit, and you’ll hear that these riffs are just slightly differently arranged Necrophobic, or death metal riffs rather, written and performed to inflict maximum damage. These riffs slice and cut through flesh, the drums hammer away in reckless abandon and the trachea rendering shrieks make people and small animals flee in fear. Other than that, the obvious influences of Bathory, Celtic Frost, Possessed and early Slayer are very hard not to miss, both conceptually as musically. Much of what would later become this band’s calling card (and the genre as a whole, really) are the piercing, tormented shrieks and rasps, the razorsharp slashing riffing and eerie melodies, plus the seemingly constant blasting drums which batter the listener into submission through repetition. The lyrics talk about the usual assorted subjects of evil, Satan, Lucifer and related imagery. They are far more vivid and imaginative than they would be on later albums. This is the template, in concept and architecture, from which later albums would be built. The biggest difference is that those albums are not nearly as effective, haunting and malevolent sounding as this often-neglected debut. On the whole the album relies much on its novelty factor, and the shock value of the extremity presented. When being truthful, the album kind of drags towards the end because all these tracks sound incredibly similar, and the overall lack of dynamic range doesn’t help matters either. “The Secrets Of the Black Arts” is a good, even a great, album but it isn’t one that inspires a lot of replayability. Only the title track and the two EP tracks is what make this record as strong as it is, and they deviate from the formula. At the center of the coven is guitarist/main composer David Parland (Blackmoon), along with second guitarist Mikael Svanberg (Ahriman). He would become the de facto leader and the spokesperson of Dark Funeral after this album’s completion. On vocals we have Paul Mäkitalo (Themgoroth) who provides bass guitar along the way, and laying down the drums for this debut is Peter Eklund (Equimanthorn). Parland, Mäkitalo and Eklund would all depart at various times and for various reasons after this album’s completion making this the only album of the original line-up. This is also why this album sounds markedly different from future output, and while superficial similarities are abound Svanberg’s writing is a hollow shell and a pale imitation of what Parland wrote for this outing. It’s the only record to feature a cover painting by Kristian Wahlin (Necrolord) and the last English titled release outside of the preceding self-titled EP, the “Teach the Children To Worship Satan” EP from 2001 and the band disowned bootleg “Under Wings Of Hell” from 2002. As you’ll note the preceding EP and this debut have vastly different artwork in comparison to the works to come. The artwork by Kristian Wahlin is something you’d usually associate with Swedish death metal, melodic or otherwise. The logo is also slightly different from future albums. This is due to copyrights held by ousted co-founder David Parland. David Parland, after all, was Dark Funeral. The band’s modus operandi was fairly unique at the time, as both they and fellow Swedes Marduk were cultivating this blast-oriented branch of black metal. Dark Funeral’s approach is straightforward and uncomplicated, relying on a continual flow of blastbeats and unrelenting waves of flesh tearing tremolo riffing, all delivered in blistering speeds. Outside of a few scant melodies there’s little what sets these songs apart, and only the two older songs and Von cover track sound actually different from the freshly written material present here. Dark Funeral is an entirely different beast than Necrophobic. Although both share a similar melodic slant, and a heritage of earlier thrash metal in its foundation and overall architecture – Dark Funeral is ultimately the more over-the-top and extreme of the two units. At a blistering pace the band cut through 9 original tracks and a Von cover. Outside of the compact intro there’s no respite to be found, nor a breather. Of the 9 nine originals two tracks (‘My Dark Desires’ and ‘Shadows Over Transylvania’) are re-recordings from the earlier self-titled EP. In all “The Secrets Of the Black Arts” is interesting in the ways that it differs from the Svanberg-led albums to come. As far as 90s black metal goes this is one of the more engrossing examples of the minimalist, barbaric side of the spectrum. This album would inspire legions of imitators and copycats for decades to come. With the more atmospheric Norwegian releases, and the cult-ish Hellenic albums released around this time, Dark Funeral was at the forefront of this extreme new metal style. One can only imagine what this band would have sounded like had Parland remained with them.